Peter is often held up to as a model of faith, strength and leadership, but this was not always the case. He began his life before he met Jesus as a humble married fisherman. In the gospel this Sunday, we meet Peter and his friends after they have come back to shore after a night of fishing. They have caught nothing; their boats and nets are empty and have nothing to show for their hard nights work. The fishermen are more than likely cold, tired and disappointed. Then Jesus, who probably doesn’t know anything about the fishing business, casually asks them to go back out after they have just come back in. Peter, perhaps after some anger and confusion agrees to do what Jesus asks. What a change of fortune; their luck changes and they bring in the biggest catch of their lives. Peters tiredness and confusion turns to guilt. He is very hard on himself. Humbly he falls to his knees in front of Jesus and cries out, ‘Leave me Lord, for I am sinful man.’ Peter wrongly assumes that Jesus will give out to him and walk away. But Jesus has other ideas and plans for him. Jesus reassures Peter with the famous line from scripture, ‘Do not be afraid.’ Then Jesus calls and invites Peter and the others to be his disciples; they leave their nets and boats and follows him. While Peter sees himself as a failure and a sinner, Jesus see so much more. He sees in Peter what Peter cannot see. Jesus sees the hidden and buried potential that lies within him. Peter sees only his past; Jesus sees his future. 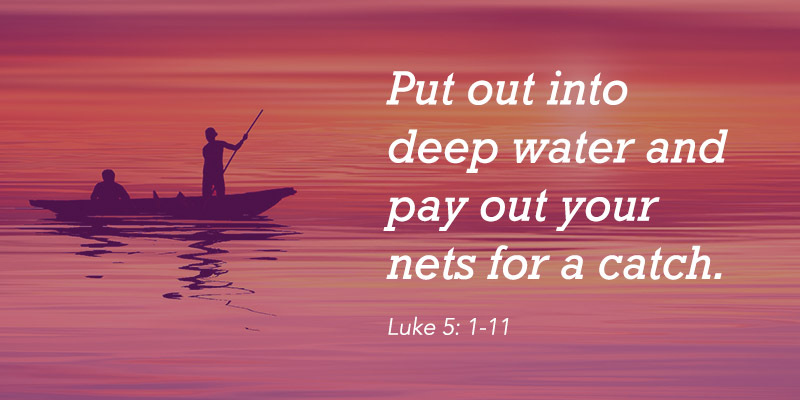 Despite his normal human weakness and frailty, Jesus has great plans for this very ordinary fisherman. Peter will become the chosen leader of Jesus’ disciples. Even when he denies Jesus three times, Jesus neither condemns or criticises Peter. If we are honest with ourselves, we are not so different from Peter. When we only see our faults, Jesus sees our potential, when we only see what we have done wrong, Jesus sees what we can do well; when we dwell on our past, Jesus calls us to look our future with faith, hope and courage. Jesus knows us better than we know ourselves. Jesus knows that we fall and make mistakes; Jesus knows all too well our sinfulness and still loves us and calls us by our name to follow him just as he called Peter. When we feel that our situation is hopeless, Jesus says to us, ‘Do not be afraid.’ Despite our failings and weaknesses, we too are called like Isaiah and Peter. God did great things for and through Peter. If we follow Jesus, God will do great things for and through us today.